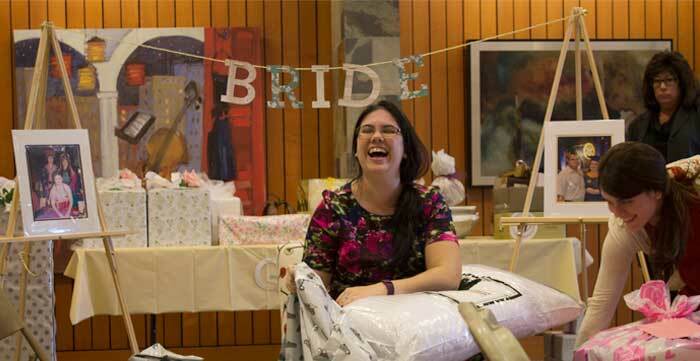 What happens when two artists, one of which is also an art teacher, plan a bridal shower together? 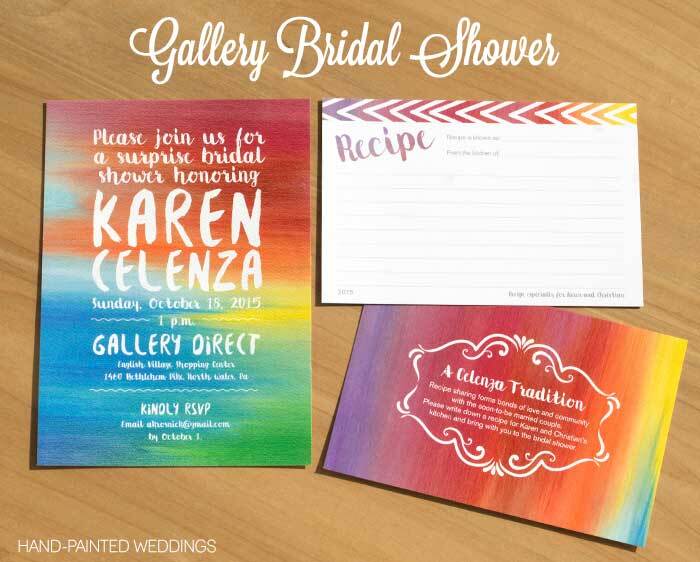 They plan an artists inspired bridal shower! Over the weekend, my mom and I held a surprise shower at a local art gallery, and it turned out so beautiful that I’m excited to share our ideas in order to inspire other bridal parties who are planning bridal showers. We DIY’ed the decor, centerpieces, and the delicious food. I also painted and designed the invitation. 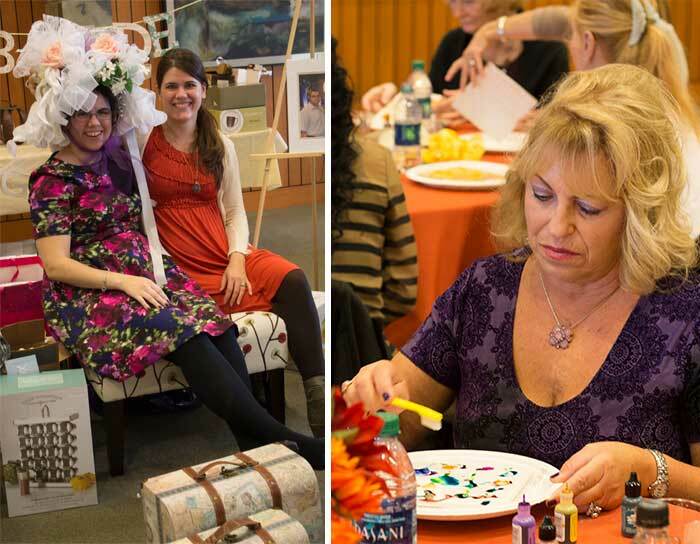 We DIY’ed the bridal shower to make the event more personal, and frankly, to save money. Let’s start with the bridal shower invitation. The design features an abstract oil painting on canvas with brushstroke white font overlaying it. The canvas texture printed really well on the textured watercolor paper I always print on. It was very exciting to use oil painting instead of watercolor on this design. The second part of the invitation is a blank recipe card that has a place for guests to write in their recipe and on the back it is branded to match the invitation while giving the guests some instructions. 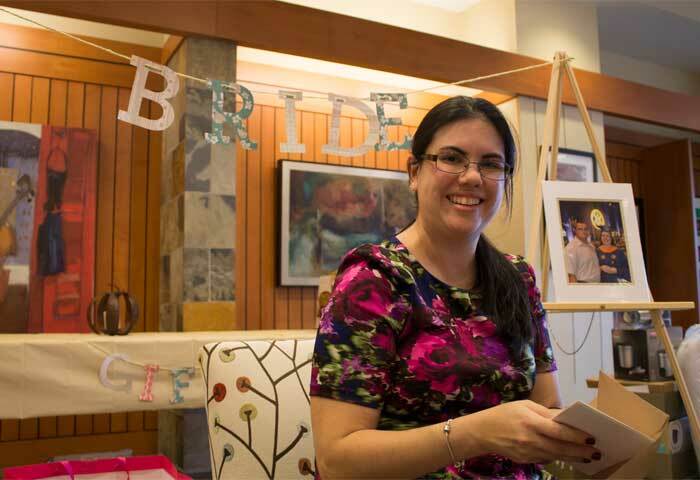 It was a fun way for the bride to collect a bunch of family recipes, and it is something that my mom also had at her wedding, so it was a tradition handed down. There was a recipe box at the entranceway of the gallery for guests to put their recipe cards in when the entered. For our centerpieces, we made each look like an artist’s still life with various art supplies around it. We had a wine centerpiece with corks surrounding a few bottles of alcohol. We had a gourd table with a bunch of fun fall appropriate gourds. We also had a Van Gogh inspired still life with a bouquet of sunflowers and a mini canvas. We used items that we had around our homes already, so that saved a lot of money. In terms of traditional bridal shower things we skipped…we decided against games and favors. In lieu of games and favors, we did a craft, which worked well with the artist inspired bridal shower theme. 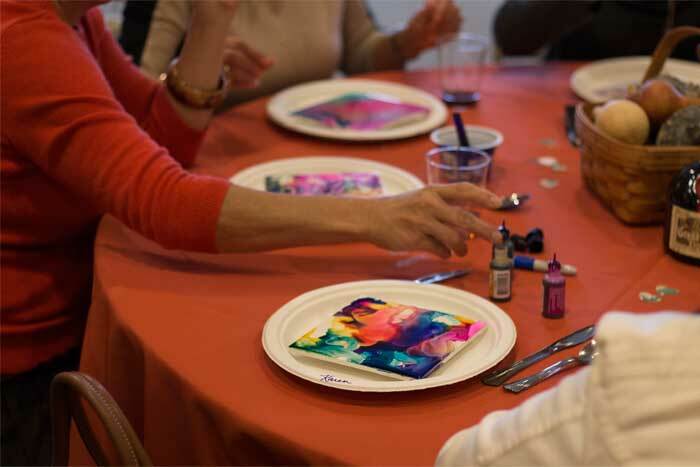 We gave every guest a 6″ square tile and each person used alcohol ink to splatter their own designs, which blended together similar to a bright watercolor painting, but was completely easy and skill free, for all those guests out there that say they don’t have an artistic bone in their body. Everybody loved doing a craft instead of a game, and each guest got to bring home a custom piece of art. This was also a budget friendly idea because each tile cost less than $1 and each table shared a set of alcohol inks. A couple of other ways we brought creativity into this shower were through the DIY cut letter signs like the one saying “Bride” hanging from two easels above my sister’s spot for opening presents. I also brought in my fun graphic upholstered chair for her to sit in while she opened her gifts, making it that much more special. We enlarged photos of the bride in various locations around the world because my sister has such a heart for third world countries, and hung these matted photos on easels around the gallery. All in all, we heard people say that it was the best bridal shower they’d ever been to, which really flooded our hearts with love because of all the work we did in planning this gallery bridal shower.